Hundreds of Saudi Shias rallied in the east of the kingdom on Friday to support activists whose execution they fear could be imminent, a witness said. It was the second Friday in a row that a mass gathering had been held in solidarity with Shia cleric Nimr al-Nimr and other death row detainees. Activists say three of them were minors at the time of their arrest after protests that began in 2011 in eastern Saudi Arabia, where most of the country’s Shia minority live. Nimr was a driving force behind the protests that developed into a call for equality in the Sunni-ruled kingdom, where many Shias have complained of marginalisation. Friday’s prayer gathering in an open area of Shia-majority Qatif, on the Gulf coast, aimed “to show solidarity with Sheikh Nimr and the rest of the detainees,” said Hussein al-Nemr, who is no relation. He estimated the crowd at 600 or 700 and said they carried pictures of the detained cleric. “It was a big one,” he said of the rally, which followed a similar gathering in the Eastern Province town of Awamiya last week. Amnesty International said in late November that Nimr al-Nimr and five other Shiite activists were at imminent risk of execution and were “clearly convicted in unfair trials”. The London-based human rights group said the six were among more than 50 people who could soon be put to death in a single day. Media “close to the Saudi Arabian authorities” had reported on the execution plans and said al Qaeda “terrorists” would also be among those put to death, Amnesty said. 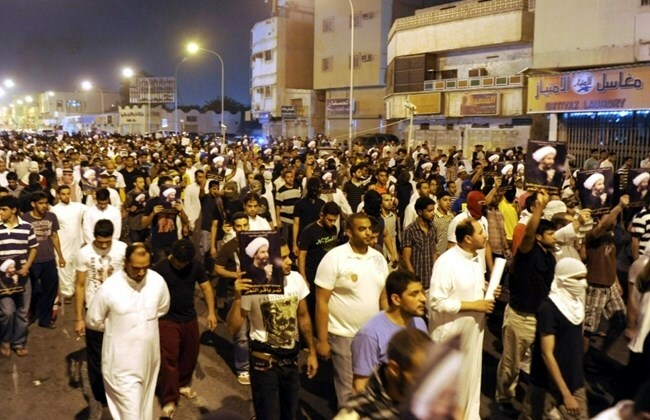 Shiites accuse authorities of issuing such reports in an effort to gauge public reaction. So they have turned out in public to show they are siding with the “innocent” detainees, Nemr said.